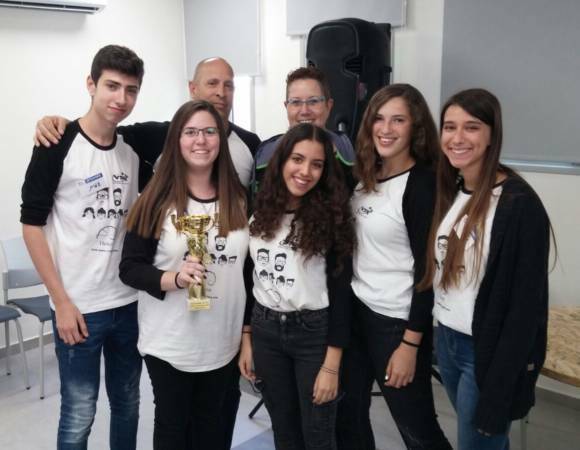 The final stage of the Hack 70 for Pedagogical Innovation contest was conducted recently by the organizing company, Gr8minds, with endorsement by the ICT Department in the Israeli Ministry of Education. The final hackathon began at 16:00, and ended the next day at 11:00. 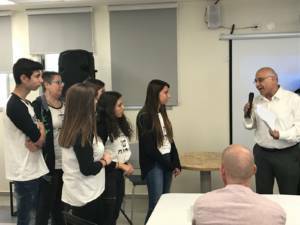 The team of referees for the finals was headed by Mr. Roni Dayan, Information Technologies Department manager in the Ministry of Education, and included senior department members as well as entrepreneurs with a proven track record. The contest progressed through several stages: preparations, nomination for the regional finals, qualification for the national finals, and participation in the finals. 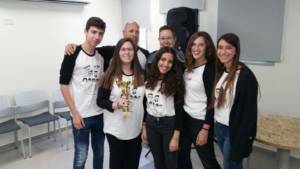 Four schools from across Israel shared the first prize, including the team from Sci Tech Kiryat-Bialik. 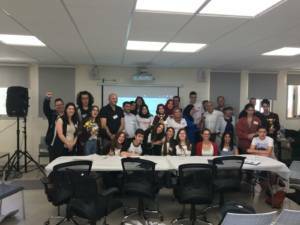 Sci Tech Kiryat-Bialik’s team included the students Lauren Greenberg, Tal Moshe, Na’ama El-Al, Or Avitan, and Amit Daniel. The students, who study in the advanced “Nachshon-Talpiot” programme, developed the “Helen” app (named after Helen Keller), which translates what the teacher says in class to sign language, supporting the integration of deaf or hard-of-hearing students in mixed classes with hearing students. This exciting and compassionate idea was brought up by team member Lauren Greenberg. The students were assisted throughout the process by their Grade Level Coordinator, Ophir Shadmi, together with Smadar Shahaf, the school’s ICT Coordinator. Along with the trophy, the winning schools will be awarded with resources and consultation towards establishing technological incubators, in order to develop and realize their initiatives.